Parkour! BMX! Skateboarding! Pogo stick? Which one is not like the other? Most people would say pogo stick, as it typically is not associated with extreme sports like the other three. However, since the early 2000s, the world of extreme pogo-ing has been on the steady rise. With events like Pogopalooza becoming more popular, this movement currently shows no sign of stopping soon. Let's back up and talk about the history of the pogo stick. George Hansburg is the man who patented the pogo in 1919. Legend has it that George was traveling in Burma where he met a man with a daughter name Pogo. The father invented a stick that Pogo could jump on every day, to and from the temple. As the legend goes, this is where George received the inspiration to invent a similar jumping stick for recreational use. While the pogo stick legend is not true, the first boatload of wooden jumping sticks was imported from abroad. However, when the shipment arrived at the New York City Gimble Brothers Department Store in 1919, the wooden sticks rotted on the ship ride over and were not sellable. Gimble asked George, a baby furniture and toy designer, to produce a more resilient jumping stick, and thus the metal and enclosed-spring pogo stick that we know and love today was created. Pogo sticks have continued to fascinate people for decades by the simple challenge of jumping up and down. World records have been set, shows have been performed, and even marriage vows have been exchanged, all on the pogo stick. The 1920s saw the height of popularity for the pogo stick, with the Ziegfeld Follies, a popular series of Broadway productions, blazing the trail of pogo stick entertainment. Interest in the pogo stick has recently been revitalized with the Extreme Pogo movement, also known as Xpogo. Today's pogo sticks can now reach a height of 10 feet! Tricks like the "One-Foot Peg Grab" and the "Under The Leg Bar Spin" have become universal terms within Xpogo communities, with new tricks being invented every day. Pogopalooza, the annual world championship for Xpogo, had its 10-year anniversary this year in New York City. 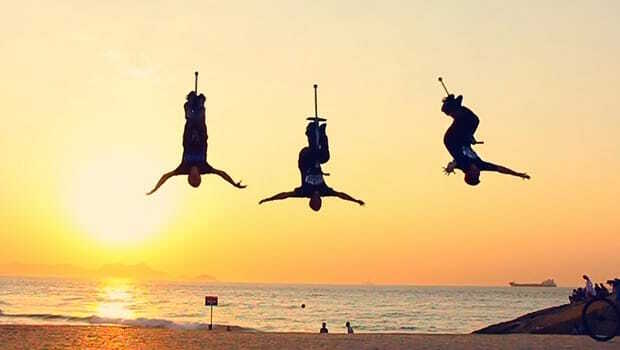 Check out this video on Xpogo, made right here in NYC! Why Should You Care About the Pogo Stick? The pogo stick is a longtime form of entertainment in the U.S. with both traditional and modern influences. Keep an eye on the famous X Games, maybe some day Xpogo will be added as a new category!